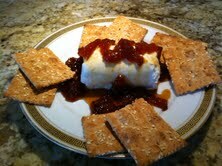 TheArmenianKitchen.com : Goat Cheese with Fig Preserves - a perfect match! If you can't find certain Armenian food products in a Middle Eastern store, your best-bet is to attend a food festival at the nearest Armenian church - seriously! That's how I discovered the Noyan brand of preserves made in Armenia. I was compelled to purchase a jar of fig preserves – an act in which I am not ashamed. The figs, left whole, were swimming in very sweet (not in a bad way, mind you!) syrup flavored with vanilla. Our first sampling included one fig, cut into thin strips, served with a cup of Armenian coffee. WOW! That’s all I can say. This past weekend, I wanted to share the fig preserves with guests in such a way that the sweetness wasn’t going to be completely over-powering. What came to mind was to serve it as an appetizer paired with tangy goat cheese. It was a no-brainer, really! Place the goat cheese on a serving plate. Top with the chopped figs; drizzle with some if the syrup from the jar. Spread onto Ak-Mak wheat crackers. NOTE: If you’re planning on a larger crowd, use a bigger log of goat cheese, and add more of the preserves. Hi, I ended up here while looking for recipes for rose petal jam, Armenian style, as I was thinking of making some rose jam and a dear, well-travelled elderly friend was saying the other day that she regretted never having been to Armenia (she's a poet and great reader and loves Mandelstam), so I thought I might try to find an Armenian recipe for it and give her some. Anyway, if I found one here I mislaid it, because I've been so delightfully distracted by this wonderful site, and all the other delicious recipes to be found here - I think I could spend a year and a day trying them all out, though sometimes finding the ingredients would be a challenge; I live in Brittany and food-wise things are rather conservative here. There are quite a few fig trees around in gardens though, and sometimes the fruits ripen and sometimes they don't, but I found a Turkish recipe for sweet pickled unripened figs, which I have made and they are delicious, particularly with goat's cheese, which we have good local versions of. You have to boil them plain first, to squeeze out the bitter sap. Lucy, thank you so much for this most-delightful comment. I hope you will enjoy your visits to our site and the recipes found within. And thank you for the rose petal jam site, too! The Noyan preserves are good. Personally, I prefer the Ararat brand, available online here (http://www.sweetgourmet.com/-Preserves-C50.aspx) or on Amazon (who knew?). It seems to be more natural and the flavors are better. The cookbook "Armenian Cuisine" (http://www.armenian-cuisine.com/) has a recipe for rose petal jam. I should mention that Ararat has rose petal preserves, as do others, apparently. Hey, just found out: Harvest Song *also* has rose petal preserves. And I *know* their preserves are awesome and available online. I found the rose petal jam on the Harvest Song site, and I think I must have found you from there. Their produce looks gorgeous, though sending to Europe is probably rather prohibitive, and I like to make my own preserves anyway. Lovely to browse there too though! Robyn served the goat cheese and fig preserves to my husband and I -- we are very lucky to volunteer as recipe testers! Highly recommended!